The impact of stem cell biology on medicine is likely comparable to the unraveling of the human genome and recombinant DNA technology in the context of envisioned future therapies. This vision brings many challenges outside of the immediate scientific development hurdles. The core science behind adult and pluripotent stem cell therapies and current clinical development status will be discussed, including the impact of global regulatory policies on models of practice and medical tourism. The bioprocessing industry is adapting to meet scale requirements in manufacturing and personalized medicine paradigms for practice. iPS technology is driving genome science and epigenetic technology to enable personalized diagnostics and personalized treatment, leading to a paradigm where post-natal tissue collection and genome analysis will determine individual healthcare futures. Bringing regenerative medicine to the standard of care is now facing its biggest hurdle with reimbursement expectations confronting ceilings in our healthcare system. Patient and industry advocacy organizations are building community engagement to attract development capital and construct economically sound business models for this future. 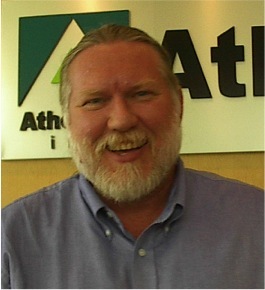 ROBERT DEANS is responsible for regenerative medicine technology development at Athersys Inc. and its European subsidiary, ReGenesys. Athersys is developing cell therapeutics based on adherent stem cells (MultiStem) isolated from adult bone marrow. Athersys has active Phase I and II clinical development activity in acute myocardial infarct, stroke, ulcerative colitis, and for adjunctive therapy of allogeneic bone marrow transplant. Robert is also chairman of the ISCT Commercialization Committee and serves on a number of Regulatory advisory committees. Robert has more than 20 years of experience in stem cell therapeutics, having previously served at Osiris Therapeutics as VP of Research. He was previously Director of R&D at Baxter Healthcare, where he developed biological components of the Isolex300i hematopoietic stem cell purification platform. In addition, he served on the faculty at USC Medical School from 1984 to 1992. He holds degrees from MIT and the University of Michigan, and postdoctoral training in molecular immunology at UCLA. President John Ingersoll called the 2,309th meeting to order at 8:23 pm December 14, 2012 in the Powell Auditorium of the Cosmos Club. Mr. Ingersoll announced the order of business and introduced two new members of the Society, including the speaker of the evening. The minutes of the 2,308th meeting were read and approved. Mr. Ingersoll then introduced the speaker, Mr. Robert Deans of Athersys. Mr. Deans spoke on "Stem Cells: Challenging Clinical Applications." Mr. Deans began by explaining how to isolate stem cell product from adult bone marrow donations instead of using embryonal stem cells. The isolated adherent stem cells can be amplified many times ex vivo, providing a considerable number of clinical doses from a single sample. He is very excited about the potential to deliver curative therapies but warned that there will be complications in ensuring they are economically viable and fit into the existing healthcare system. Currently, he said, the industry cannot afford to bring these new therapies to the patients that need them and will have to be creative and careful to consider the economics as well as the science. It takes an incredible amount of capital to move through the clinical study cycle to create a product, as well as extensive collaboration with patient advocacy groups, the translational physician community, and private insurance companies. Mr. Deans described how bone marrow transplants pushed forward regenerative medicine by demonstrating that it was possible to restore the immune system with a stem cell product. He explained that they can produce over two hundred thousand clinical doses from a single healthy donor, each with a five year shelf life. The cells are not immunogenic and do not stimulate an immune response even after multiple treatments. In fact, they turn off an inflammatory injury response and also turn off an allogeneic rejection response. He noted that the old paradigm of one donated organ or tissue for one patient, which must be immunologically matched, has been superseded. The cell type he works with is more of a biologics paradigm, usable "off the shelf" like an antibody or a drug. The older transplant paradigm had not been an appealing business model, but the biologics paradigm has spurred multiple large capital investments into the field. However, Mr. Deans believes that when we are able to easily generate patient tissues from their own induced pluripotent stem cells, the field will eventually return to the transplant model of personalized medicine. Mr. Deans explained that the basic model cell model is that that of a delivery vehicle. Cells are put into circulation and move out of the blood system into the tissue that has evidence of inflammation or injury. When they find the site of inflammation, they express a series of biological factors that prompt repair within several days. When the cells induce repair they act in a number of ways, such as downregulating inflammation, stopping T-cells and immune cells from cytolytic destructions, blocking apoptosis in the brain and heart, aggressively stimulating new blood vessel formation, and recruiting other progenitors from the host to generate new tissue. Mr. Deans continued by describing how to measure the pharmacokinetic/pharmacodynamic profile of the cells, tracking where the clinical product travels, how long it acts, and how long it stays in the system. Tracking a therapeutic cell is very difficult, but they genetically modify the cells with the enzyme luciferase, isolated from fireflies and inserted into the cell. Cells can be identified by supplementing lab animal's diet without harm to the animal. After injured the gut in a mouse, cell product is injected through the tail vein and it is possible to see the cells spread through the body from the injection site, he said. Within six hours most cells have migrated to the liver and lung and by twenty four hours most are near the gut, demonstrating that the cells are a smart biologic that goes where it is specifically needed. Other animals that receive an ischemic injury in the heart, simulating a heart attack, show that the the majority of the cells are found in the thorassic cavity and that about 90% of the cells are lost over a seven day period. A more precise way to track cells is whole body imaging technology, which can achieve 75% mass balance accounting by computationally reconstruct the animal from high resolution photographs of 50 micron frozen slices. Mr. Deans described a pre-clinical model to induce myocardial infarction in pigs, then inject cells near but not at site of injury and observe migration. They Measured success through blood ejection fraction from the heart and level of scar formation and saw a statistically significant rebound in ejection fraction and reduction in scar size after cell treatments. In a phase 1 clinical study, patients showed a clear trend in improvement with increasing cell dose. Additionally, patients showed longer term improvement at the one year scale and also overall mortality after five years. Mr. Deans stated is very anxious to continue to develop this cardiovascular treatment program given such promising progress. Further studies have included patients with ischemic stroke injury, where a blockage of blood flow into the brain which induces cell death and long term motor and cognitive dysfunction. Applying the treatment right after a stroke has produced good results and Mr. Deans very optimistic about the approach. There have also been promising rodent models developed for multiple sclerosis and spinal cord injury, where animals that receive cell product show marked improvement that he attributes to limiting the inflammatory damage and promoting the growth of axon ends back across the region of injury, respectively. Mr. Deans concluded by explaining that delivering a large number of cells that promote a wound repair response can limit the damage to the tissue seen by the immune cells trying to clear up the injury, accelerate repair of the tissue including host regeneration. He worries that the bioprocessing industry has not yet built the tools to streamline the cell product manufacturing, making large scale studies and production prohibitively expensive. He also foresees an upcoming shift in the industry to low-margin, high-volume treatments, which he believes will be beneficial to the patient. Ultimately, regenerative medicine is changing dramatically and he encourage the audience to provide feedback to the industry through patient advocacy groups and the NIH. After the question and answer period, Mr. Ingersoll thanked the speaker and invited Program Chair Larry Millstein to present the General Committee election results. Mr. Millstein reported that John Ingersoll was elected to the position of President, Justin Stimatze was elected to the position of Recording Secretary, Robin Taylor was elected to the position of Corresponding Secretary, and Pierre Cartier was elected to the position of Member At Large. Mr. Ingersoll then thanked the outgoing members of the General Committee for their service, made the usual housekeeping announcements, and invited guests to apply for membership. At 10:04 pm, President John Ingersoll adjourned the 2,309th meeting to the social hour.